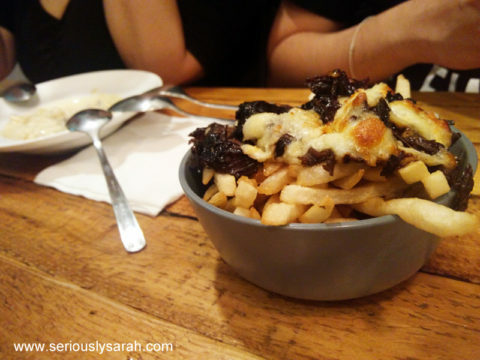 I just wanted to talk about this pulled beef fries with cheese I ate at Wilder. It’s under the ‘sides’ in the menu if you ever decide to visit them. My crew and I just wanted to go there for the desserts but we did skip lunch somewhat just to eat dinner, so there. We ordered our mains which was pretty delicious and pretty much choped the tarts that was left that night. However, this pulled beef fries and cheese. This is not meant to be shared. It’s meant to be hoarded by one or you could buy the pulled beef with the mashed cauliflower and vege instead because wow. As Max said. This is like a Halal version of what char siew is. The generous pile of beef under that baked cheese. And there were four of us there. And then our mains came so all was well.